Clicking edit on a match will bring up the reporting modal. 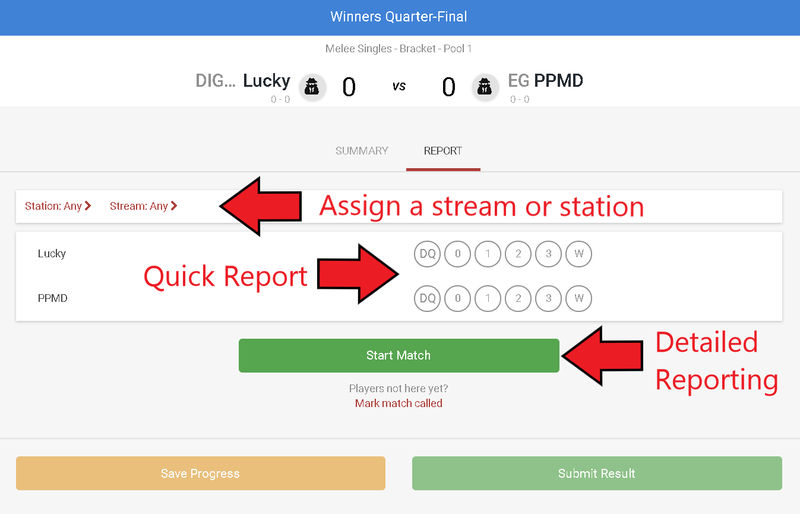 Quick Report will let you report Win, Loss, or DQ. It will also let you report the match score (3-0, 2-1, etc.). Clicking Start Match will start a timer on the match and mark it in progress. It also adds "Report game data" which allows for more detailed reporting. These details are not required, and you can always just report using the quick report as shown above. Game data is only available for specific games. 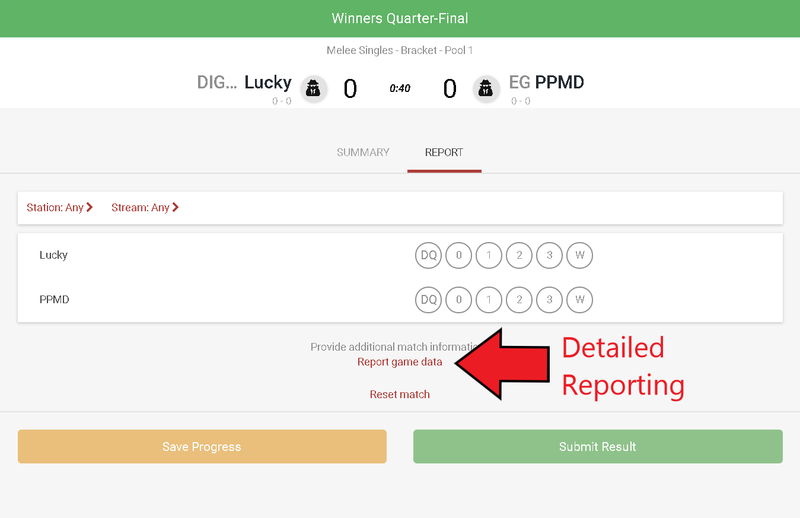 If your game does not have detailed match reporting please let us know by contacting us! The reporting modal allows you to assign matches to a station or stream. Clicking Any Station brings up a modal that lets you pick the station. Each station rows shows the number of unplayed matches at that station. Check this article for more information on stations. If you assign a set to a stream it will add that match to the Stream Queue. See our guide on streams for more information. Unless the match in question is assigned to a stream where player reporting is blocked, entrants in head to head online tournaments are able to report their own scores. If there is a dispute, entrants can call for a moderator. Free-for-all events have three different methods by which to report games. If you choose to report scores manually, you’ll be prompted to enter data for the entrants in that group. You do not have to enter information for all entrants, but you will not be able to finalize the set unless there is a clear set of standings to progress the event. When you are done, Save Results will progress to the next game, or if this is the final game, to the Finalize screen. On the Finalize screen, you can double check that all data is correctly entered. Finalize will move entrants onto their next set if there is another one to progress to. For some games, like PUBG, we offer the ability to report via the game’s API. 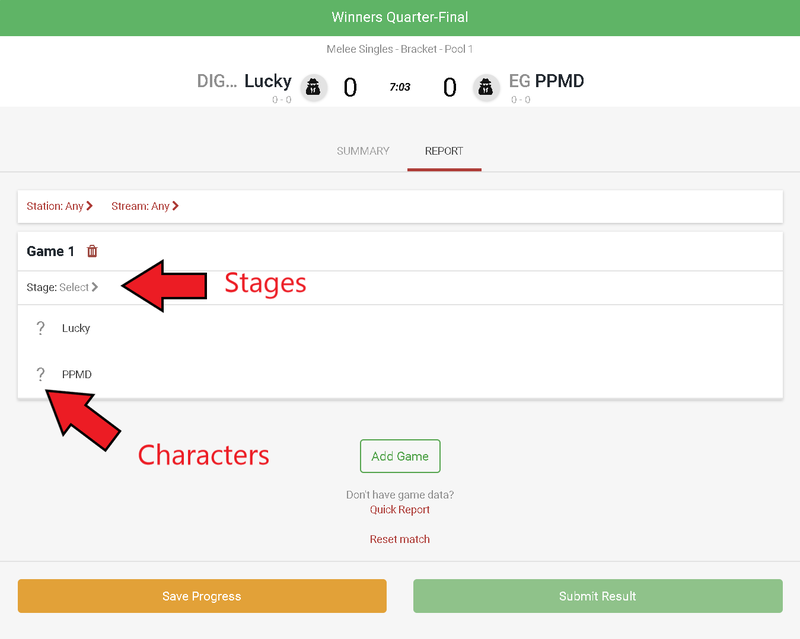 This means nobody has to input scores - they are pulled directly from the game, ensuring accuracy and saving time for you and your entrants! To use this functionality, click on Report via API. You will be presented with a list of games that matches the PUBG IDs of entrants within your group. Assuming those IDs are correct (these can be fixed by you on the Attendees table or by the user via Manage Registration), the game with the highest match percentage should be the correct game. Click link to attach this API data to the current game, and you’ll be prompted to report the next game. or to finalize results for the set. When turned on, admins can allow players to report their own scores via the set dialogue. Players will enter their Placement and Kills, which will be aggregated for Admins on the results screen. If you notice a discrepancy between the actual results and the reported ones, you can edit them as well. Edited scores will appear with an asterisk, making it clear that the admin has altered them.